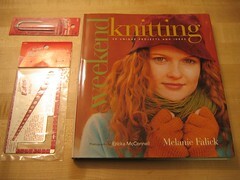 yay for my knitting secret pal! this has been one of those books that i guiltily absorb page-by-page, during extensively stolen afternoons at the bookstore. my pal writes (in a cute striped, reribboned card) that this is her favorite knitting book, and she is happy to share its splendor! there’s also some superduper helpers: a cable stitch holder and a needle gauge / ruler thingy. so handy! thanks so much for all the cute easter-time gifts and cards. some-bunny really is looking forward to trying out these projects on an upcoming weekend!